, an eminent English divine, and for his excellent character and usefulness, called the “Apostle of the North,” was descended from a good family in Westmoreland, and born in 1517, at Kentmire in that county. He was the son of Edwin Gilpin, by Margaret daughter of William Laton of Delain in Cumberland. From his earliest youth he was inclined to a contemplative life, thoughtful, reserved, and serious, which giving his parents an early presage of his future piety, they determined to educate him for the church. His first years wete spent at | a public school, whence he was removed to Oxford, and at the age of sixteen was entered upon the foundation at Queen’s college. 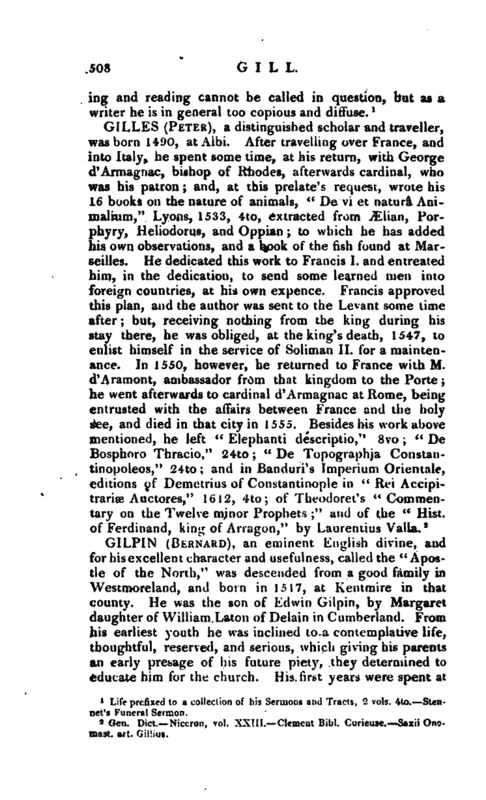 Besides his academical studies, to which he applied with great industry, he appears to have read while here some of the works of Erasmus, which at their first appearance were not very popular, and discovered in them a treasure of real learning, which he had in vain sought after in the writings then in most esteem. 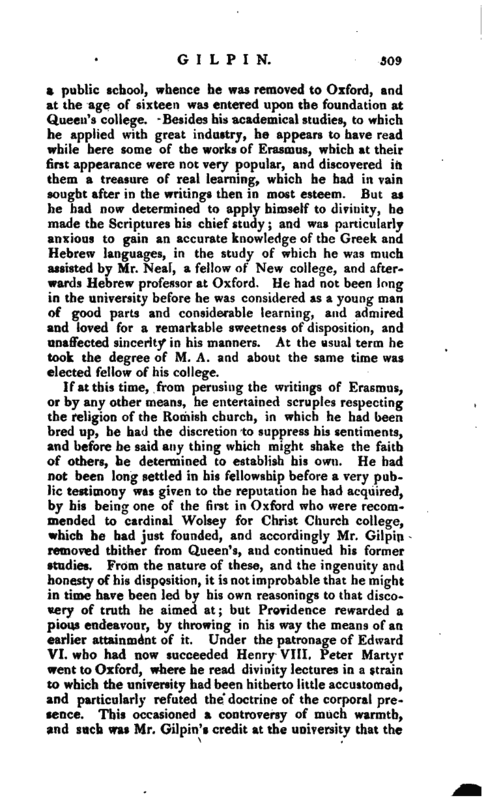 But as -he had now determined to apply himself to divinity, he made the Scriptures his chief study; and was particularly anxious to gain an accurate knowledge of the Greek and Hebrew languages, in the study of which he was much assisted by Mr. Neal, a fellow of New college, and afterwards Hebrew professor at Oxford. He had not been long in the university before he was considered as a young man of good parts and considerable learning, and admired and loved for a remarkable sweetness of disposition, and unaffected sincerity in his manners. At the usual term he took the degree of M. A. and about the same time was elected fellow of his college. If at this time, from perusing the writings of Erasmus, or by any other means, he entertained scruples respecting the religion of the Romish church, in which he had been bred up, he had the discretion to suppress his sentiments, and before he said any thing which might shake the faith of others, he determined to establish his own. 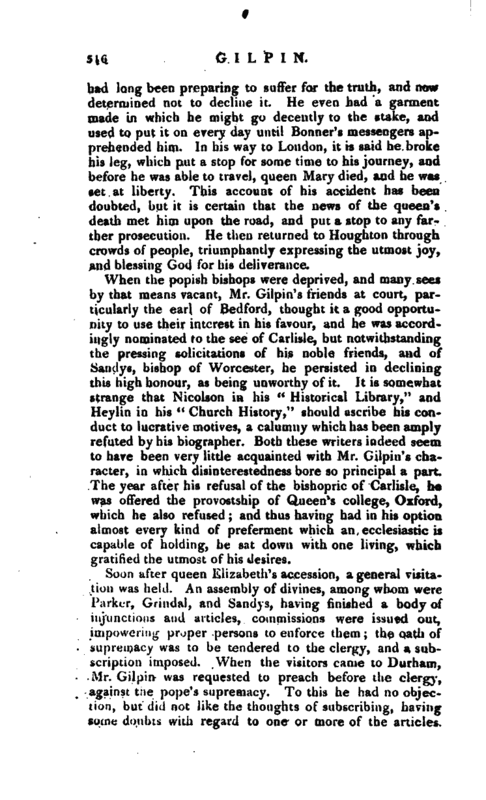 He had not been long settled in his fellowship before a very public testimony was given to the reputation he had acquired, by his being one of the first in Oxford who were recommended to cardinal Wolsey for Christ Church college, which he had just founded, and accordingly Mr. Gilpin removed thither from Queen’s, and continued his former studies. From the nature of these, and the ingenuity and honesty of his disposition, it is not improbable that he might in time have been led by his own reasonings to that discovery of truth he aimed at; but Providence rewarded a pious endeavour, by throwing in his way the means of an earlier attainment of it. Under the patronage of Edward VI. who had now succeeded Henry VIII. Peter Martyr went to Oxford, where he read divinity lectures in a strain to which the university had been hitherto little accustomed, and particularly refuted the doctrine of tl^e corporal pretence. This occasioned a controversy of much warmth, such was Mr. Gilpia’t credit at the university that the | popish party were very solicitous to engage him on theic side. But, although he was as yet but imperfectly acquainted with the arguments of the reformers, he had, it seems, lately discovered, through a dispute he had been engaged in with Dr. Hooper, afterwards bishop of Worcester, that several of the Romish doctrines were not so well supported by Scripture as was commonly imagined; and, with a mind in this unsettled condition, he thought himself but ill qualified to espouse either side publicly. 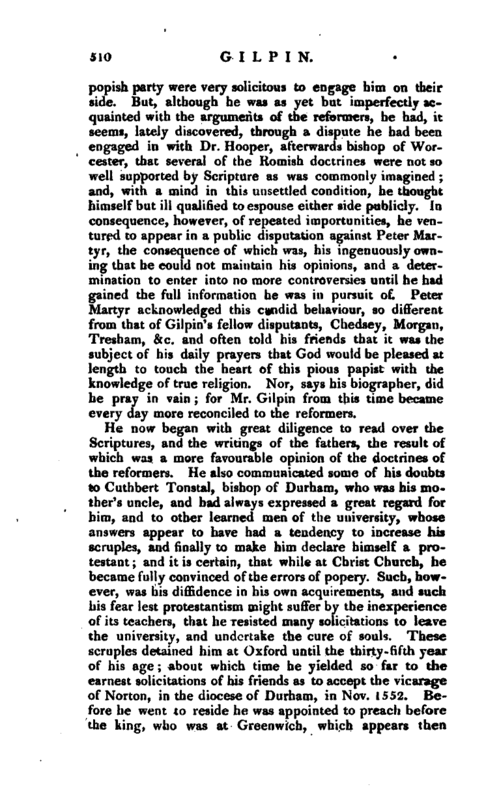 lit consequence, however, of repeated importunities, he ventured to appear in a public disputation against Peter Martyr, the consequence of which was, his ingenuously owning that he could not maintain his opinions, and a determination to enter into no more controversies until he had gained the full information he was in pursuit of. Peter Martyr acknowledged this candid behaviour, so different from that of Gilpin’s fellow disputants, Chedsey, Morgan, Tresham, &c. and often told his friends that it was the subject of his daily prayers that God would b*j pleased at length to touch the heart of this pious papist with the knowledge of true religion. Nor, says his biographer, did he pray in vain; for Mr. Gilpin from this time became every day more reconciled to the reformers. He now began with great diligence to read over the Scriptures, and the writings of the fathers, the result of which was a more favourable opinion of the doctrines of the reformers. He also communicated some of his doubts to Cuthbert Tonstal, bishop of Durham, who was his mother’s uncle, and had always expressed a great regard for him, and to other learned men of the university, whose answers appear to have had a tendency to increase his scruples, and finally to make him declare himself a protestant; and it is certain, that while at Christ Church, he became fully convinced of the errors of popery. Such, however, was his diffidence in his own acquirements, and such his fear lest protestantism might suffer by the inexperience of its teachers, that he resisted many solicitations to leave the university, and undertake the cure of souls. These scruples detained him at Oxford until the thirty-fifth year of his age; about which time he yielded so far to the earnest solicitations of his friends as to accept the vicarage of Norton, in the diocese of Durham, in Nov. 1552. Before he went to Beside he was appointed to preach before the king, who was at Greenwich, which appears then | to have been a custom before being presented to any benefice. On this occasion, with the true spirit of a reformer, he inveighed against the luxurious and corrupt manners of the times among all ranks, and although the king was not then present, delivered what he intended as an address to his majesty, not doubting, as he said, but that it would be carried to him. This courage recommended him to the notice of many persons of the first rank; particularly to sir Francis Russel, and sir Robert Dudley, afterwards earls of Bedford and Leicester, who from that time professed a great regard for him; and, when in power, were always ready to patronize him. Gilpin received their offered friendship with humility and gratitude, but never solicited it on his own account. 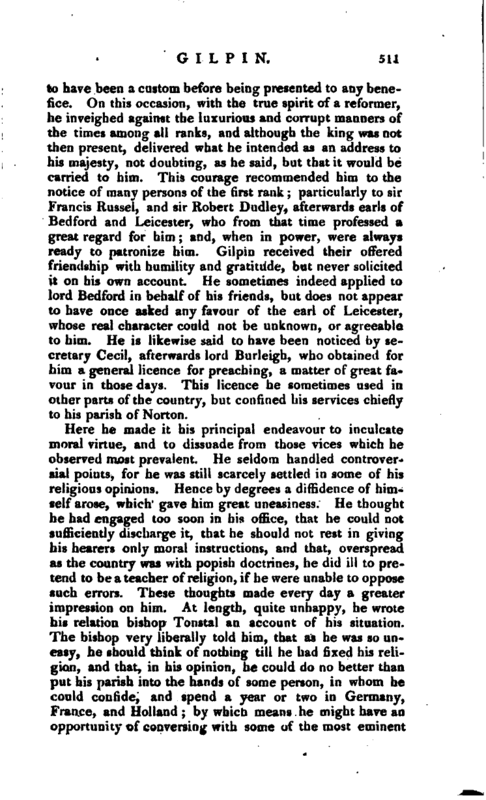 He sometimes indeed applied to lord Bedford in behalf of his friends, but does not appear to have once asked any favour of the earl of Leicester, whose real character could not be unknown, or agreeable to him. He is likewise said to have been noticed by secretary Cecil, afterwards lord Burleigh, who obtained for him a general licence for preaching, a matter of great favour in those days. This licence he sometimes used in oilier parts of the country, but confined his services chiefly to his parish of Norton. Here he made it his principal endeavour to inculcate moral virtue, and to dissuade from those vices which he observed most prevalent. He seldom handled controversial points, for he was still scarcely settled in some of his religious opinions. Hence by degrees a diffidence of himself arose, which gave him great uneasiness. He thought he had engaged too soon in his office, that he could not sufficiently discharge it, that he should not rest in giving his hearers only moral instructions, and that, overspread as the country was with popish doctrines, he did ill to pretend to be a teacher of religion, if he were unable to oppose such errors. These thoughts made every day a greater impression on him. At length, quite unhappy, he wrote his relation bishop Tonstal an account of his situation. The bishop very liberally told him, that as he was so uneasy, he should think of nothing till he had fixed his religion, and that, in his opinion, he could do no better than put his parish into the hands of some person, in whom he could confide, and spend a year or two in Germany, France, and Holland; by which means he might have an pportunity of conversing with some of the most eminent | professors on both sides of the question. He acquainted him likewise, that his going abroad at this time would do him also a considerable service; for, during his confinement, he had written two or three books, particularly one upon the Lord’s Supper, which he had a desire to publish; and as this could nor be so conveniently done at home, he would be glad to have it done under his inspection at Paris. This letter gave Mr. Gilpin much satisfaction, a conference with some of the learned men abroad being what his heart had been long set on. One objection, however, was the expencc, but the bishop told him his living would do something towards his maintenance, and deficiencies he would supply; but this did not remove a greater difficulty. Mr. Gilpin’s notions of the pastoral care were so strict, that he thought no excuse could justify non-residence for so considerable a time as he intended to be abroad. He could not, therefore, think of supporting himself with any part of the income of his living, and having discovered a person, with whose abilities and inclinations to discharge the duties of it, he was well acquainted, he resigned it to him, and set out lor London, to receive his last orders from the bishop, and to embark. The bishop received him at first -with some displeasure, but such an instance of sincerity could not fail to raise him higher in his esteem, although be would afterwards frequently chide him for these qualms of conscience, and would be often reminding him, that if he did not look better to his interest, he would certainly die a beggar. 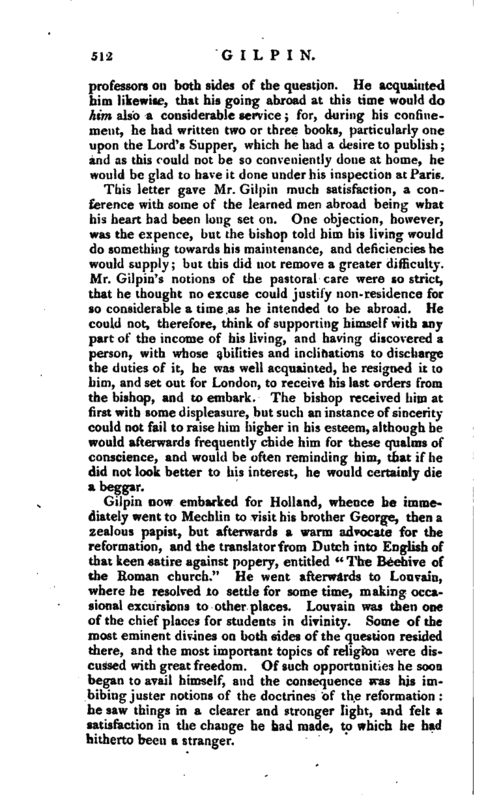 Gilpin now embarked for Holland, whence he immediately went to Mechlin to visit his brother George, then a 2ealous papist, but afterwards a warm advocate for the reformation, and the translator from Dutch into English of that keen satire against popery, entitled “The Beehive of the Roman church.” He went afterwards to Louvain, where he resolved to settle for sometime, making occasional excursions to other placet. Loinrain was then one of the chief places for students in divinity. Some of the most eminent divines on both sides of the question resided there, and the most important topics of religion were discussed with gfeat freedom. Of such opportunities he soon began to avail himself, and the consequence was his imbibing juster notions of the doctrines of the reformation: he saw things in a clearer and stronger light, and felt a satisfaction in the change he Uad made, to whichhe had hitherto been n stranger. | While thus pursuing his studies, he heard the important news from England of queen Mary’s accession to the crown, whose bigotry was well known, and in whom the signs of a persecuting spirit already appeared; and at the same time learned that his relation bishop Tonstal was released from the Tower, and reinstated in his bishopric. 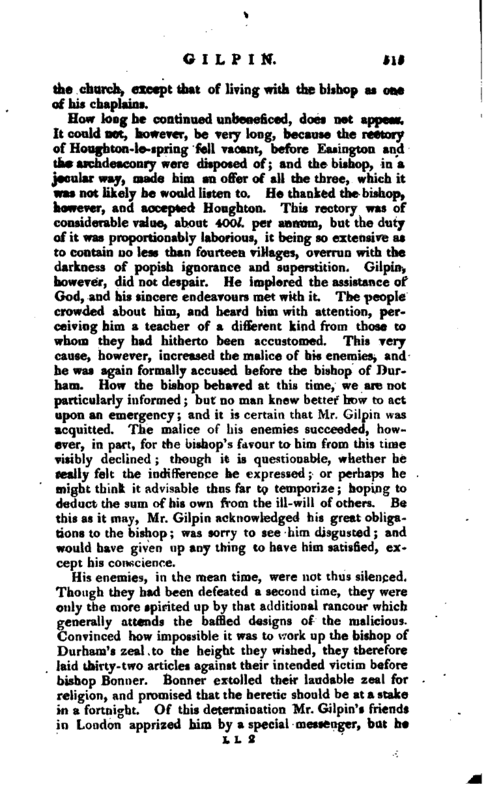 The first consequence of this last event was the offer of a living, which Mr. Gilpin declined in a long letter, the unaffected piety of which disarmed all resentment on the part of the bishop, and led him rather to admire a behaviour, in which the motives of conscience shewed themselves so superior to those of interest. After remaining two years in Flanders, to which his countrymen were daily flocking to escape the sanguinary laws of queen Mary, he took a journey to Paris, in order to print the bishop of Durham’s book on the Sacrament, with which that prelate had intrusted him. This work of Tonstal’s was written so much in a spirit of moderation respecting the extravagant popish doctrine of the Sacrament, that Gilpin was generally supposed to have corrupted it, which he refuted by shewing the bishop’s letter of thanks for his “care and fidelity” as an editor. While Mr. Gilpin staid at Paris, he lodged with Vascosan, the eminent printer, to whom he had been recommended by his friends in the Netherlands, and who shewed him great regard, introducing him to the most considerable men in that city. Here popery became quite his aversion; he saw more of its superstition and craft than he had yet seen; the former among the people, the latter among the priests, who scrupled not to avow how little truth was their concern. 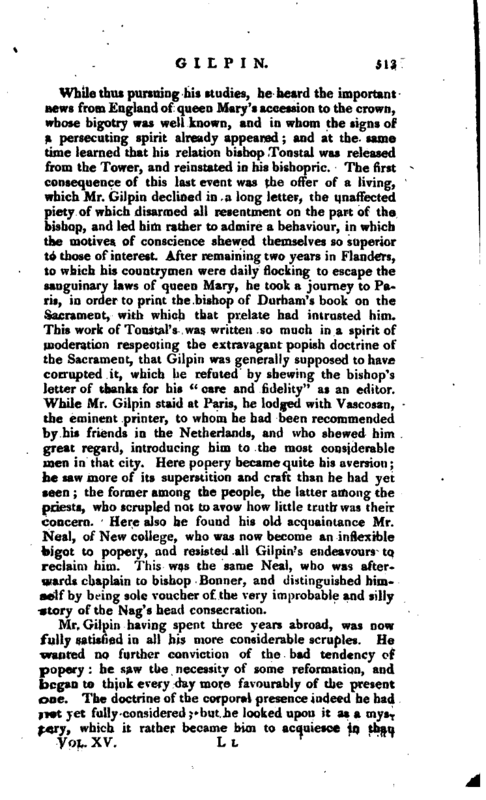 Here also he found his old acquaintance Mr. Neat, of New college, who was now become an inflexible bigot to popery, and resisted all Gilpin’s endeavours to reclaim him. This was the same Neal, who was afterwards chaplain to bishop Bonner, and distinguished himself by being sole voucher of the very improbable and silly story of the Nag’s head consecration. Mr. Gilpin having spent three years abroad, was now fully satisfied in all his more considerable scruples. He wanted no further conviction of the bad tendency of popery: he saw the necessity of some reformation, and began to think every day more favourably of the present one. The doctrine of the corporal presence indeed he had not yet fully considered; but he looked upon it as a mystery, which it rather became him to acquiesce in than | examine. The principal end of his going abroad being thus answered, he was desirous, of return ing iion:eb,ut ap the Marian persecution was still raging, his mends suggested that it was little less than madness to think of going to a place, from whence all of his sentiments were endeavouring to withdraw themselves. 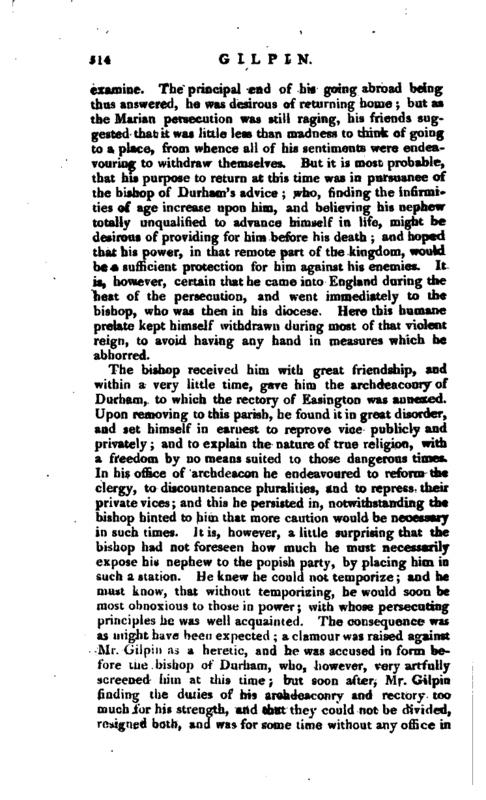 But it is most probable, that his purpose to return at this time was in pursuance of the bishop of Durham’s advice; who, rinding the infirmities of age increase upon him, and believing his nephew totally unqualified to advance himself in life, might be desirous of providing for him before l.is death; and hoped that his power, in that remote part of the kingdom, would be a sufficient protection for him against his enemies. It is, however, certain that he came into England during the heat of the persecution, and went immediately to the bishop, who was then in his diocese. Here this humane prelate kept himself withdrawn during most of that violent reign, to avoid having any hand in measures which he abhorred. The bishop received him with great friendship, and within a very little time, gave him the archdeaconry of Durham, to which the rectory of Easington was annexed. Upon removing to this parish, he found it in great disorder, and set himself in earnest to reprove vice publicly and privately; and to explain the nature of true religion, with a freedom by no means suited to those dangerous times. In his office of archdeacon he endeavoured to reform the clergy, to discountenance pluralities, and to repress their private vices; and this he persisted in, notwithstanding the bishop hinted to him that more caution would be necessary in such times. It is, however, a little surprising that the bishop had not foreseen how much he must necessarily expose his nephew to the popish party, by placing him in such a station. He knew he could not temporize; and he must know, that without temporizing, he would soon be most obnoxious to those in power; with whose persecuting principles he was well acquainted. The consequence was as might have been expected; a clamour was raised against Mr. Gilpin as a heretic, and he was accused in form before the bishop of Durham, who, however, very artfully screened him at this time; but soon after, Mr. Gilpin finding the duties of his archdeaconry and rectory too nauch for his strength, and that they could not be divided, resigned both, and was for some time without any office in | the church, except that of living with the bishop as one of his chaplains. How long he continued unbeneficed, does not appear. It could not, however, be very long, because the rectory of Houghton-le-spring fell vacant, before Easington and the archdeaconry were disposed of; and the bishop, in a jocular way, made him an offer of all the three, which it was not likely he would listen to. He thanked the bishop, however, and accepted Houghton. This rectory was of considerable value, about 400l. per annum, but the duty of it was proportionably laborious, it being so extensive as to contain no less than fourteen villages, overrun with the darkness of popish ignorance and superstition. Gilpin, however, did not despair. He implored the assistance of God, and his sincere endeavours met with it. The people crowded about him, and heard him with attention, perceiving him a teacher of a different kind from those to whom they had hitherto been accustomed. This very cause, however, increased the malice of his enemies, and he was again formally accused before the bishop of Durham. How the bishop behaved at this time, we are not particularly informed; but no man knew better how to act upon an emergency; and it is certain that Mr. Gilpin was acquitted. The malice of his enemies succeeded, however, in part, for the bishop’s favour to him from this time visibly declined; though it is questionable, whether he really felt the indifference he expressed; or perhaps he might think it advisable thus far to temporize; hpping to deduct the sum of his own from the ill-will of others. Be this as it may, Mr. Gilpin acknowledged his great obligations to the bishop; was sorry to see him disgusted; and would have given up any thing to have him satisfied, except his conscience. His enemies, in the mean time, were not thus silenced. Though they had been defeated a second time, they were only the more spirited up by that additional rancour which generally attends the baffled designs of the malicious. Convinced how impossible it was to work up the bishop of Durham’s zeal to the height they wished, they therefore laid thirty-two articles against their intended victim before bishop Bonner. Bonner extolled their laudable zeal for religion, and promised that the heretic should be at a stake in a fortnight. Of this determination Mr. Gilpin’s friends in London apprized him by a special messenger, but he | had long been preparing to suffer for the truth, and now determined not to decline it. He even had a garment made in which he might go decently to the stake, and used to put it on evejy day until Bonner’s messengers apprehended him. In his way to London, it is said he broke his leg, which put a stop for some time to his journey, and before he was able to travel, queen Mary died, and he was get at liberty. 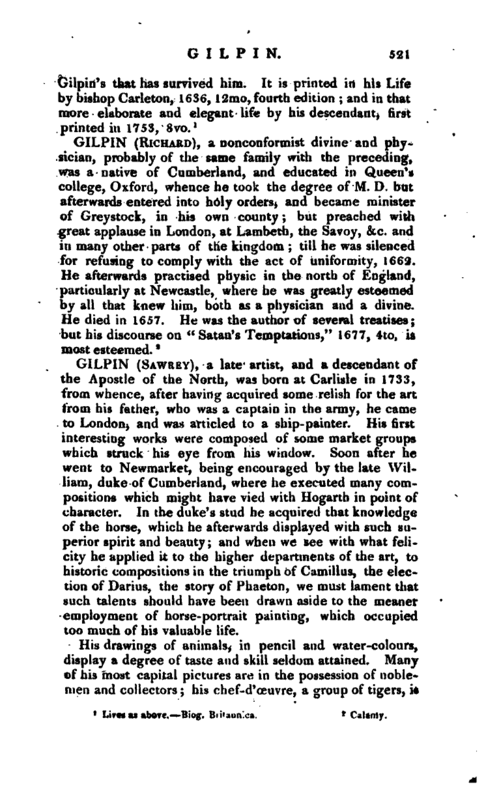 This account of his accident has been doubted, but it is certain that the news of the queen’s death met him upon the road, and put a stop to any farther prosecution. He then returned to Houghton through crowds of people, triumphantly expressing the utmost joy, and blessing God for his deliverance. 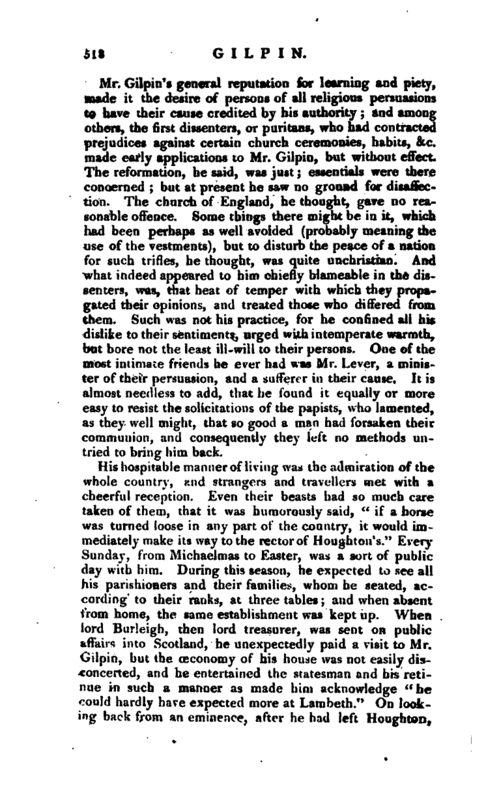 When the popish bishops were deprived, and many sees by that means vacant, Mr. Gilpin’s friends at court, particularly the earl of Bedford, thought it a good opportunity to use their interest in his favour, and he was accordingly nominated to the see of Carlisle, but notwithstanding the pressing solicitations of his noble friends, and of Sandys, bishop of Worcester, he persisted in declining this high honour, as being unworthy of it. It is somewhat strange that Nicolson in his “Historical Library,” and Heylin in his “Church History,” should ascribe his conduct to lucrative motives, a calumny which has been amply refuted by his biographer. Both these writers indeed seem to have been very little acquainted with Mr. Gilpin’s character, in which disinterestedness bore so principal a part. The year after his refusal of*the bishopric of Carlisle, he was offered the provostship of Queen’s college, Oxford, which he also refused; and thus having had in his option almost every kind of preferment which an ecclesiastic i capable of holding, he sat down with one living, which gratified the utmost of his desires. Soon after queen Elizabeth’s accession, a general visitation was held. An assembly of divines, among whom were Parker, Grindal, and Sandys, having finished a body of injunctions aud articles, commissions were issued out, impowering proper persons to enforce them; the oath of supremacy was to be tendered to the clergy, and a subscription imposed. 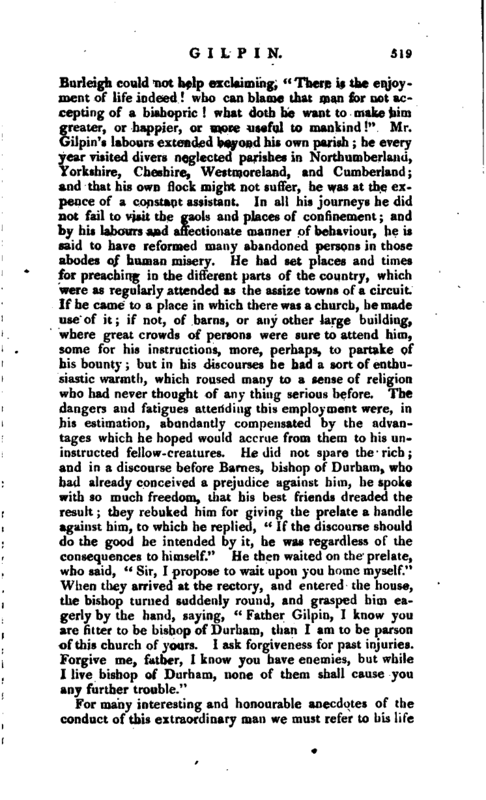 When the visitors came to Durham, Mr. Gilpin was requested to preach before the clergy, against the pope’s supremacy. To this he had no objection, but did not like the thoughts of subscribing, having some doubts with regard to one or more of the articles. | His curate having not these scruples, he hoped that his subscription might satisfy the visitors; but next clay, when the clergy were assembled to subscribe, as an instance of respect Mr. Gilpin was first called upon. The emergency allowed him no time for reflection. He just considered with himself, that upon the whole these alterations in religion were certainly right; that he doubted only in a few immaterial points; and that, if he should refuse, it might be a means to keep others back. He then took up the pen, and, with some hesitation, at length subscribed. Afterwards retiring, he sent a letter to the visitors, acquainting them in what sense he subscribed the articles; which they accepted very favourably. When in order to enlighten the nation in true learning and religion, public schools began to be recommended, Mr. Gilpin endeavoured to promote the good work with the utmost of his ability. 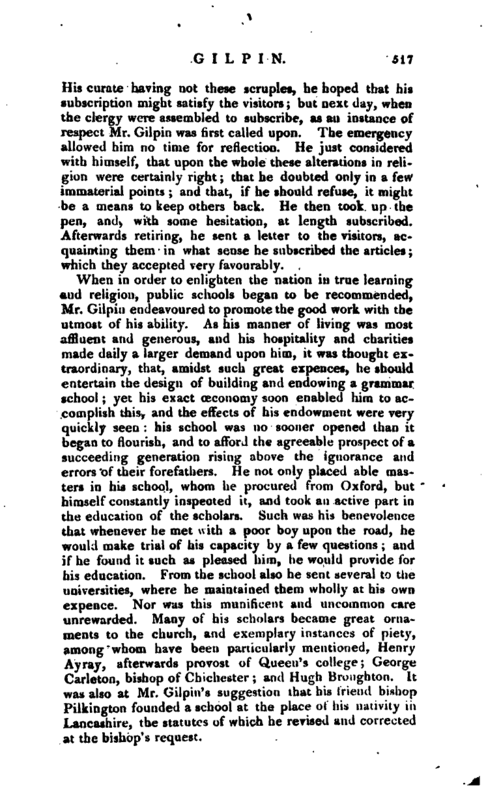 As his manner of living was most affluent and generous, and his hospitality and charities made daily a larger demand upon him, it was thought extraordinary, that, amidst such great expences, he should entertain the design of building and endowing a grammar school; yet his exact ceconomy soon enabled him to accomplish this, and the effects of his endowment were very quickly seen: his school was no sooner opened than it began to flourish, and to afford the agreeable prospect of a succeeding generation rising above the ignorance and errors of their forefathers. He not only placed able masters in his school, whom he procured from Oxford, but himself constantly inspected it, and took an active part in the education of the scholars. Such was his benevolence that whenever he met with a poor boy upon the road, he would make trial of his capacity l)y a few questions; and if he found it such as pleased him, he would provide for his education. From the school also he sent several to the universities, where he maintained them wholly at his own expence. Nor was this munificent and uncommon care unrewarded. Many of his scholars became great ornaments to the church, and exemplary instances of piety, among whom have been particularly mentioned, Henry Ayray, afterwards provost of Queen’s college; George Carleton, bishop of Chichester; and Hugh Broughton. It was also at Mr. Gilpin’s suggestion that his friend bishop Pilkington founded a school at the place of his nativity in Lancashire, the statutes of which he revised and corrected at the bishop’s request. | Mr. Gilpin’s general reputation for learning and piety, made it the desire of persons of all religious persuasions to have their cause credited by his authority; and among others, the first dissenters, or puritans, who had contracted prejudices against certain church ceremonies, habits, &c. made early applications to Mr. Gilpin, but without effect. The reformation, he said, was just; essentials were there concerned; hut at present he saw no ground for disaffection. " The church of England, he thought, gave no reasonable offence. Some things there might be in it, which had been perhaps as well avoided (probably meaning the use of the vestments), but to disturb the peace of a nation for such trifles, he thought, was quite unchristian. And what indeed appeared to him chiefly blameable in the dissenters, was, that heat of temper with which they propagated their opinions, and treated those who differed from them. Such was not his practice, for he confined all his dislike to their sentiments, urged with intemperate warmth, but bore not the least ill-will to their persons. One of the most intimate friends he ever had was Mr. Lever, a minister of their persuasion, and a sufferer in their cause. It is almost needless to add, that he found it equally or more easy to resist the solicitations of the papists, who lamented, as they well might, that so good a man had forsaken their communion, and consequently they left no methods untried to bring him back. For many interesting and honourable anecdotes of the conduct of this extraordinary man we must refer to his life | by his descendant the late rev. William Gilpin. The present article has reached its utmost length, but will not be useless it' it direct the attention of the reader to one of the most exemplary pieces of biography in our language. It remains only to notice, that after a life devoted to every virtue that can dignify the character of an ecclesiastic, he found himself in February 1583 so weak, from a fall, and the infirmities of age, as to be sensible that his end wag drawing near. He told his friends of his apprehensions, and spoke of his death with great composure. He was soon confined to his chamber; but retained his senses to the last. 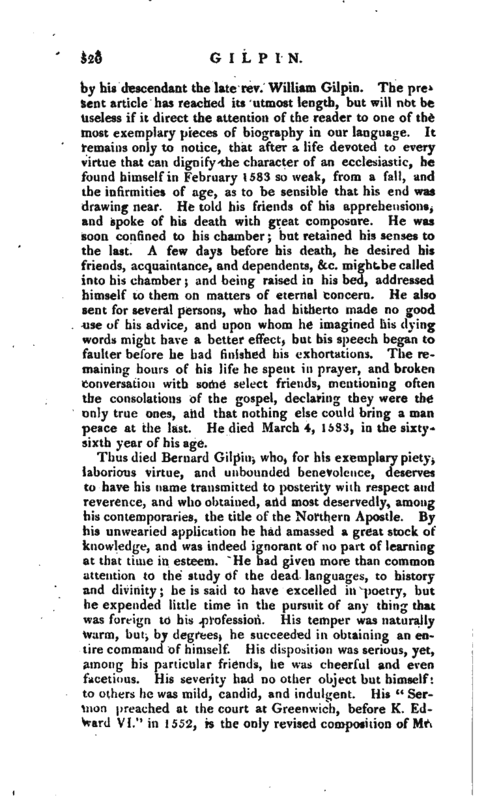 A few days before his death, he desired his friends, acquaintance, and dependents, &c. might be called into his chamber; and being raised in his bed, addressed himself to them on matters of eternal concern. He also sent for several persons, who had hitherto made no good use of his advice, and upon whom he imagined his dying words might have a better eftect, but his speech began to faulter before he had finished his exhortations. The remaining hours of his life he spent in prayer, and broken conversation with some select friends, mentioning often the consolations of the gospel, declaring they were the only true ones, and that nothing else could bring a man peace at the last. He died March 4, 15S3, in the sixtysixth year of his age. Lives as above. Biog. BmaiiHica.